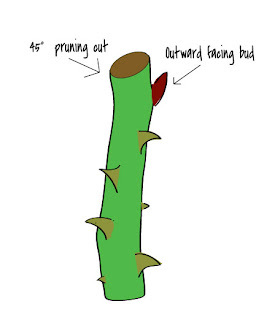 Now is the perfect time to get out your pruning shears and attack your rose bushes! Although it seems like winter still stretches out interminably before us, spring is actually approaching. Now, just as plants begin to break their dormancy and their buds are beginning to swell, is the time to prune most cane plants. Regular pruning promotes healthy growth and lush flowering in cane plants. Many of our flowering shrubs can be categorized as “cane plants.” These plants continue to send up new shoots from their bases, where they typically have formed a clump. Roses and forsythia are our most common examples; the group also includes bamboo, kerria, weigela and deutzia among others. Before you reach for your pruning shears, there is an important first step: take a good look at your shrub. What do you see? Are there dead canes? Even in winter, dead canes will appear different from live ones: they will look shriveled and blackened. These will be the first things to prune away. Now take a longer look and envision how you would like your plant to ultimately look. Forsythia, like many cane plants, has a gently weeping shape. Pruning should enhance the beauty of this shape. Although clipping forsythia into a hedge is fairly common, it does not highlight the beauty of the plant. I recommend putting down the hedge clippers in favor of pruning shears. In general, we prune cane plants by removing the canes close to the ground. When we prune, we are actually helping the plant by “de-cluttering” it. Old canes often give the shrub a stiff structure, rather than a graceful form. Removing canes that are touching or crossing will open up the plant visually and allow for air flow as well, helping to prevent disease. We are also helping to keep the plant at the size we want – rather than the 10 or 15 ft. in height it might want to achieve on its own! The actual process of pruning isn’t difficult. Using CLEAN pruning shears or loppers, get down close to the ground and remove the dead canes, along with any puny or diseased ones. Then remove the canes you’ve identified that are cluttering the plant. If you have a bush that hasn’t been regularly pruned, you may wind up removing a major portion of the plant. If you prune annually, removing about 1/8 to ¼ of the plant is typical. If you are pruning an older plant, especially one that hasn’t been recently pruned, you may need to use a small pruning saw to remove some of the old wood in the center of the plant. This can be a challenge (especially on thorny rose bushes), but it will improve the appearance and health of your plants. These old, hardened canes often clutter up the center of the shrub, and flower very little. Most canes don’t flower in the first year (roses are the exception here). Forsythia, for example, will not flower on new wood; they begin flowering the second year, then they flower profusely for a few years and start to slack off. This is true for some climbing roses as well. Removing older canes regularly and encouraging younger canes to grow will maximize the flower production on your bush. Also prune away the ends that are touching the ground: on a vigorous bush like forsythia, they’ll root, causing an unruly clump. The guidelines above work for roses as well. For hybrid tea roses (the most common roses in our gardens), we also prune back the individual canes. Leave only strong branches on roses, and prune so that they are growing outward; cut at a 45° angle just above a bud facing outward. Roses are prone to fungal diseases and adequate air flow will help keep them healthy. You should also prune away any suckers on your rose bushes. Suckers are shoots coming out from the roots; they are common in grafted plants such as older roses. Uncover the sucker with a trowel and nip it away where it meets the roots. One of the great things about cane plants is their vigor: they’re hard to kill. If you’re overenthusiastic in your pruning, you may lose a season of bloom, but they’ll likely come back stronger and better next year. For more detail on pruning roses, click here. For forsythia and similar shrub pruning, here is a video with more information.